Triton Stormwater Solutions is a registered Michigan company that is dedicated to providing our customers with the best stormwater products, customer service and state-of-the-art manufacturing processes available. Triton Stormwater Solutions has answered the call for a stronger, lightweight, comprehensive underground stormwater chamber management solution that effectively addresses the maintenance issues associated with underground systems, Triton Stormwater Solutions has also kept the environment in mind by producing a revolutionary new soy resin-based material for the chamber product. Triton Stormwater Solutions chamber system saves time, money and land, and offers greater LEED potential than other systems. Triton Stormwater Solutions chambers are 46% lighter than competitive polymer products, and also have increased capacity and strength. They are so strong, in fact, that they can be double-stacked to greatly decrease the drain-field footprint needed, and they have been tested to withstand a rear axle load of 48,000 pounds with only 18" of cover and with NO pavement layer. Triton Stormwater Solutions provides the greatest value-engineering of any underground stormwater retention/detention system that is available in today’s market. Triton Stormwater Solutions benefits go beyond offering a lighter, larger, stronger, more cost effective and easier to install system. Our stormwater chamber systems also are assembled quicker, easier and with less machine time. A 700 S-29 stormwater chamber system can be installed in 1 day. That’s equivalent to 2,800 lineal feet of 60" diameter pipe! Triton Stormwater Solutions chambers ARE the most cost-effective subsurface detention/retention system available. Only Triton Stormwater Solutions stormwater chambers follow and exceed the latest AASHTO LFRD Bridge Design Spec 1 safety factors for HS-20 Live Loads and Earth Loads for a performance life of greater than 50 years. Larger storage volume per square foot. Triton Stormwater Solutions saves you valuable land footprint space over any other stormwater chamber system available. Lightweight for easy construction and superior production rates for installation of underground systems. Triton Stormwater Solutions design, strength of material and Main Header Row ensures a greater longer lasting system than what is available with other stormwater chamber and pipe systems. 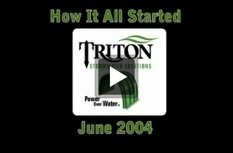 See the actual flooding condition that was the catalyst that started Triton Stormwater Solutions.